In 2016, the fashion house stopped using animal fur in all of its collections, citing the availability of "valid alternatives at our disposition that render the use of cruel practices unnecessary as regards animals." According to The Wall Street Journal and other influential sources, in addition to couture line Armani Privé, Giorgio Armani and Emporio Armani are company's ready-to-wear lines that show at Milan fashion week. 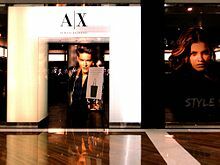 In addition, selling at lower prices are Armani Collezioni, Armani Exchange and Armani Jeans. Emporio Armani is the second brand of Armani family, features ready-to-wear and runway collections. Emporio Armani focuses on trends and modern traits. Also, Emporio Armani along with Giorgio Armani are the only two ready-to-wear brands that are mainly designed by Giorgio Armani himself, and has a spotlight at Milan Fashion Week every year while Armani Collezioni, Armani Jeans, and Armani Exchange do not. Emporio Armani is usually only sold in freestanding Emporio Armani boutiques and its official website. Apollo Minerva starred in four Emporio Armani underwear campaigns from Spring/Summer 2008 to Fall/Winter 2009-2010. David Beckham appeared with his wife, former Spice Girl Victoria, in the campaigns twice in 2009. All campaigns were photographed by Mert Alas and Marcus Piggott. In January 2010, football star Cristiano Ronaldo and Hollywood movie star Megan Fox became the male and female face and body of Emporio Armani. In 2011, Megan Fox was replaced with Rihanna and Ronaldo was replaced by tennis athlete Rafael Nadal. Emporio Armani has teamed up with Reebok to create fashion shoes under the label EA7. In 2019, Emporio Armani released a new series centered around singer, Shawn Mendes. The black-and-white advertisement featured an instrumental version of his song, "In My Blood". 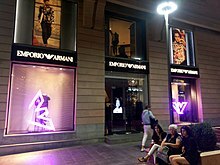 Emporio Armani has boutiques in Oslo, Frankfurt, Amman, Bahrain, Jeddah, Bogotá, Miami, Tokyo, Amsterdam, Madrid, Chicago, Paris, London, Glasgow, Los Angeles, Houston, Mexico City, Jakarta, Kuala Lumpur, Milan, Buenos Aires, Istanbul, Tel Aviv, Sydney, Dubai, Daka, Lima, Seoul, Singapore, Bangkok, New York, São Paulo, Vienna, New Delhi, and many other cities around the world. Armani Collezioni (formerly Giorgio Armani Le Collezioni) is the diffusion line of Giorgio Armani that retails at a lower price than Giorgio Armani and the haute couture line, Armani Privé. The logo is usually displayed black written on a white label, but often varies. "Armani" being larger and "Collezioni" underneath it. It provides made-to-measure tailored suits and shirts where every element can be chosen. In addition to being sold in the two freestanding boutiques (which feature the Collezioni line exclusively) in Milan and Paris, Armani Collezioni usually sold in department stores and outlets while Giorgio Armani and Emporio Armani only sold in freestanding boutiques. Last year, a sporty line of this label has appeared named "Armani Collezioni Active" in the same way as the EA7 line from Emporio Armani line. Armani Jeans is a diffusion line collection of denim-related clothing, created in 1981, by Giorgio Armani. Armani Jeans is mainly sold in department stores, although there are many freestanding Armani Jeans stores in the world, in addition to an Armani Jeans Cafe in Milan. 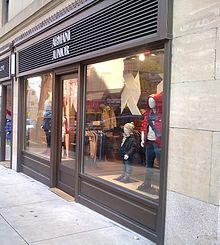 Some Armani Jeans items are sold in Emporio Armani Stores. This line does not feature Giorgio Armani's signature simplicity. The colors used are more diverse than those found in his higher end lines. Armani Exchange products are available exclusively in 270 stores in 31 countries and on the brand's website. An Armani Junior boutique in New York City, United States in 2013. Giorgio Armani also designs products specifically made for babies, toddlers and teenagers up to sixteen years old. Therefore, he came up with a new label called Armani Junior with a separate label within the product line entitled Armani Baby. The Armani Junior brand was introduced in 1979. The sub-label was often criticized in the public eye because Armani occasionally used real fur for the Armani Junior autumn and winter collections. Many people tend to think that it's unreasonable for a large amount of the public to dress small children in high-end, luxury clothing, which families with a regular or even comfortable income cannot afford. The junior line consists of baby clothing and accessories as well as T-shirts, pullovers, suits, smokings, shoes, hats, shirts, belts, bags, underwear and accessories for children and teenagers. This Armani line is often viewed as the direct competitor of the Italian luxury brand Versace's Young Versace. Armani Junior has 167 independent boutiques around the globe, which only sell the sub-label . The label is also sold in other stores by the label including Armani/Casa, Armani Jeans or Emporio Armani. In total, 308 independent and franchise Armani stores sell the Armani Junior and Armani Baby products throughout the whole world. In addition, the label is available in selected department stores everywhere in the world, for example Neiman Marcus, Saks Fifth Avenue, Breuninger and Peek & Cloppenburg. The label is a multi-million Dollar business, as the sub-label sold products woth of 2600 million Euros and earned about 750 million in 2010 and in 2011, sold products worth of about 3100 Euros and earned about 900 Euros. In 2012, the label boosted the sales, earning 1100 million Euros, selling products worth of 3600 million Euros. In 2013, the label gained sales of about 3550 million Euros, earning again 1100 million Euros that year alone. In May 2014, Quvenzhané Wallis was named the face of Armani Junior, which makes her the first major child celebrity to be the face of a luxury brand. An Armani/Casa boutique in Lisbon, Portugal in December 2007. The Armani label also consists of a furniture and home collection called Armani/Casa. While the Italian word "casa" usually means "house", its usage here instead means "at home". 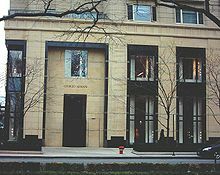 Giorgio Armani launched his interior design collection in 2000 with a flagship store opening in Milan, Italy the same year. When Armani was asked about why he wanted a furniture line, Armani said that he wanted "people to design their own private home". "Designing this furniture and home collection helped me to stimulate my creative and artistic vein", Armani said. Critics responded very positively to the Armani/Casa label calling the style "simply elegant, a little retro with Ethno elements" to it. A lot of critics also liked the fact that there are only a "few ornaments" used but with "artistic detail" which seem to have a "tremendous effect on the style and furniture" itself. Armani collaborates with Rubelli and the Molteni Group to build the home collection. As the Architectural Digest reported in February 2012, that Armani/Casa includes state-of-the-art kitchens, sold under the Armani/Dada name – a partnership with Molteni Group, as well as luxurious fabrics produced in collaboration with Rubelli. Armani/Roca is yet another partnership, which provides Giorgio Armani with bathroom furniture and accessoires. The sub-label consisting of variegated products is sold in 183 independent Armani stores as well as selected retailers throughout the world. From 2000 on, Armani/Casa is a multi-million Dollar success for the label. Armani/Casa is used in the Armani hotels, equipped John Mayers New York City apartment and decorated the scenes for the 2013 film Paranoia. A 2008 Armani/Dolci gift box. Since then, Giorgio Armani designed various other packages for the product. A confectionery is also under the Armani name. The brand was established in 2002. For the creations and collections Armani collaborates with the Italian chocolate manufacturer Venchi. Armani/Dolci sells chocolates, jams, honey, tea, shortbread biscuits, sugar, marrons glaces, fruit jellies and pralines. The brand is mostly part of other Armani stores but has got an independent boutique in Taichung, Taiwan. In total, 152 stores sell the Armani/Dolci'' products. Over the years, Armani created various limited Armani/Dolci products to celebrate special occasions. For example, Armani designed chocolate easter eggs, heart-shaped boxes with red, pink and lilac chocolate truffles for Valentine's Day, as well as a Ramadan collection for the Muslim holiday featuring refined colours of Islamic art and no alcohol. In addition, Armani/Dolci sells special delicate collections for Christmas and its significant anniversaries. The Armani/Dolci brand is well received by both critics and the public. The Armani/Fiori boutique at the Chater House in Hong Kong. The Giorgio Armani label also has a florist under its name, called Armani/Fiori. The exclusive floral service is active since 2000 in major independent flower boutiques and other Armani stores around the world. The flowers used for the Armani/Fiori arrangements come mostly from the Netherlands. The label uses a large selection of orchids, as well as exotic and tropical flowers alongside more traditional flowers such as hydrangeas, roses and peonies. Each collection is personally designed by Giorgio Armani himself as he wants to transport an "Asian feel". In addition, Armani/Fiori offers decorative elements like vases, flowerpots, candles and lanterns. For the collections, Armani uses precious materials like alabaster, black marble, lacquered wood in the shape of cylinders, cubes, and rhomboids. Giorgio Armani also designed special floral arrangements for occasions like Valentine's Day and spring collections. The labels floral arrangements are used in the Armani hotels. Giorgio Armani and Emaar Properties PJSC signed an agreement in 2005 for Emaar Properties PJSC to build and operate at least seven luxury hotels and three vacation resorts under the Armani name. Armani would be responsible for overseeing all aspects of the interior design and style of the hotels. The Armani hotel was opened in Burj Khalifa on April 27, 2010, comprising the bottom 39 floors of the supertall skyscraper in Dubai, United Arab Emirates. It has 160 guest rooms and suites, and 144 residences. Giorgio Armani also designed the interiors of the Armani Residences, also within the skyscraper, and its specially designed line of products from the Armani/Casa home furnishings collection and the Armani/Fiori flower arrangements. The "Burj Khalifa Armani Residences Road Show" toured Milan, London, Jeddah, Moscow and Delhi. The London event was housed in the Armani Casa Showroom in New Bond Street. ^ "Giorgio Armani - Vogue.it". www.vogue.it. Retrieved 7 August 2017. ^ "Giorgio Armani in Dubai, Mall of the Emirates". Mall of the Emirates. Retrieved 7 August 2017. ^ "Giorgio Armani and Mohamed Ali Alabbar Sign 'Armani Hotels and Resorts' Agreement for International Collection of Luxury Hotels and Resorts". www.businesswire.com. 2005-05-31. Retrieved 2018-12-28. ^ Alexandra Gibbs," Giorgio Armani Pledges To Go 100% Fur Free," CNBC, 23 March 2016. ^ MANUELA MESCO, "Giorgio Armani Risks Losing Its Luster"
^ Company Details. Retrieved March 26, 2011. ^ a b Schmittler, Danny (2 February 2012). "David Beckham: Emporio Armani (then), H&M (now)". The Underwear Expert. Retrieved 13 July 2013. ^ Alexander, Hilary (2 July 2009). "The Beckhams strip off again for Giorgio Armani". Telegraph.co.uk Fashion. Retrieved 13 July 2013. ^ "Rihanna Replaces Megan Fox as Face of Emporio Armani Underwear". ^ Rowley, Glenn (28 February 2019). "Shawn Mendes Shares Steamy Ad for Armani Watches: Watch". Billboard. Retrieved 28 February 2019. ^ "Quvenzhané Wallis: Star der ersten Armani Junior-Kampagne" (in German). Bunte.de. Retrieved 30 January 2016. ^ "Armani Junior". Armani. Retrieved 30 January 2016. ^ a b c "Store Locator Armani". Armani Group. Retrieved 2 February 2016. ^ "Quvenzhane Wallis named the new face of Armani". The Hollywood Reporter. Retrieved 30 January 2016. ^ "Armani Junior Financials". Fashionbi. Retrieved 30 January 2016. ^ "Quvenzhané Wallis Named Face of Armani Junior". EOnline!. Retrieved 30 January 2016. ^ "Giorgio Armani's New Home Collection". Veranda. Retrieved 30 January 2016. ^ "Armani/Casa Wohnmöbel" (in German). Architonic. Retrieved 30 January 2016. ^ "Schöner wohnen mit Armani" (in German). Luxus Welt. Retrieved 30 January 2016. ^ "Armani/Casa and Rubelli". Rubelli. Retrieved 30 January 2016. ^ "Giorgio Armani's Latest Home Collections". Architectural Digest. Retrieved 30 January 2016. ^ "Armani/Roca". Armani/Roca. Retrieved 30 January 2016. ^ "Limited Edition Armani/Casa". 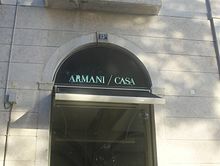 Armani/Casa. Retrieved 30 January 2016. ^ "Giorgio Armani's Influence on Hollywood". Behind the Label. Retrieved 30 January 2016. ^ "Armani Hotels & Resorts". Armani/Hotels. Retrieved 30 January 2016. ^ "John Mayer Apartment Home". Elle Decor. Retrieved 30 January 2016. ^ "Giorgio Armani Casa designs film set for Paranoia movie". Glamour Magazine. Retrieved 1 February 2016. ^ "Armani / Dolci". www.armanidolci.com. Retrieved 7 August 2017. ^ Fabricant, Florence (7 April 2009). "Chocolate Shop Opens in Armani Store – The New York Times". The New York Times. The New York Times Company. Retrieved 2 February 2016. ^ ""Armani Dolci": Armani verkauft Markenpralinen". Handelsblatt (in German). handelsblatt.com. 9 September 2002. Retrieved 2 February 2016. ^ Bumpus, Jessica (9 July 2010). "The Armani Group signs licensing deal with Venchi for Armani/Dolci (Vogue.co.uk)". Vogue Magazine United Kingdom. vogue.co.uk. Retrieved 2 February 2016. ^ "Products". Armani/Dolci. Armani Group. Retrieved 2 February 2016. ^ "Store Locator". Armani/Dolci. Armani Group. Retrieved 2 February 2016. ^ "Mode und Schokolade – Armani/Dolci Special Edition – olschis-world". Olschis World (in German). olschis-world.de. 23 September 2015. Retrieved 2 February 2016. ^ "Giorgio Armani's Armani Dolci chocolate Easter eggs to add sheen to your celebrations". Luxury Launches. luxurylaunches.com. 5 April 2010. Retrieved 2 February 2016. ^ Newbery, Hannah (14 February 2014). "Süßes von Armani/Dolci". Gourment Blog (in German). Vorkosterin. Retrieved 2 February 2016. ^ "Armani Dolci Ramadan 2015 – ZoeMagazine.net". Zoe Magazine. zoemagazine.net. 14 March 2015. Retrieved 2 February 2016. ^ Carter, Alex. "Armani Dolci's Ramadan Chocolates – Pursuitist". Pursuitist. Pursuitist Luxury Blog. Retrieved 2 February 2016. ^ Bilemjian, Talar (13 October 2014). "Armani/Dolci unveils its luxurious 2014 holiday treats | Buro 24/7". Büro 24/7. buro247.me. Retrieved 2 February 2016. ^ Sandison, Daniel (17 September 2015). "Armani 40th Anniversary Chocolate Set". Hypebeast. Media Lab Limited. Retrieved 2 February 2016. ^ Scelsi, Rosario (12 September 2015). "Giorgio Armani: 40 anni del gruppo con le delizie Armani Dolci". Deluxe Blog (in Italian). Blogo Italy. Retrieved 2 February 2016. ^ "Emporio Armani Caffé München in den Fünf Höfen. Gehobene, leichte italienische Küche zu fairen Preisen. Jetzt auch mit Terrasse" (in German). Ganz München. Retrieved 5 February 2016. ^ "Armani/Fiori". Fashion Installation. Hackaday. July 2007. Retrieved 5 February 2016. ^ "Collections: Floreal – Armani/Fiori". Armani Group. Archived from the original on 16 February 2016. Retrieved 5 February 2016. ^ "Armani/Fiori". Amsterdam Fashion TV Blog. Victoria France Holding. 24 July 2012. Retrieved 5 February 2016. ^ "Collections: Decorative elements – Armani/Fiori". Armani Group. Retrieved 5 February 2016. ^ Song, Meimei (1 February 2011). "Valentine's Day: Hong Kong Florists". Hong Kong Tatler. Edipresse Media Asia Limited. Retrieved 5 February 2016. ^ "Spring 2014 Collection from Armani/Fiori". Armani/Alive. Armani Group. 1 April 2014. Retrieved 5 February 2016. ^ "Armani Hotel Dubai – Retail". Armani/Hotels. Armani Group. Retrieved 5 February 2016. ^ "Armani hotel opens in Dubai's Khalifa tower". Associated Press. jpost.com. Retrieved 2 February 2016. ^ "Armani Hotels, Resorts & Residences". Armani/Hotels & Resorts. Armani Group. Retrieved 2 February 2016. ^ "Burj Khalifa Armani Residence". Ida.us. Retrieved 2013-02-15. Mackenzie, Suzie (2004-12-11). "The gentle touch". The Guardian. London. Retrieved 2007-09-23. McCartney, Stella (2006-05-16). "The wisdom of Giorgio". Independent on Sunday. London. Retrieved 2007-09-23. "Q & A: Giorgio Armani". CNN. The Scene (column). 2006-10-03. Retrieved 2007-09-23. Lee, Vinny (2007-09-22). "Above the shop". The Times. London. Retrieved 2007-09-23. Wikimedia Commons has media related to Armani.